Born and raised in New York City, of Puerto Rican ancestry, Anthony Rubio grew up immersed in his Latin culture loving everything from music and cuisine to the elaborate fashions which inspired his colorful palate and evolution as one of the hottest sought after designers to date. Growing up in the most rebellious and yet most expressive periods in the history of fashion helped both influence and mold him into the visionary he is today. 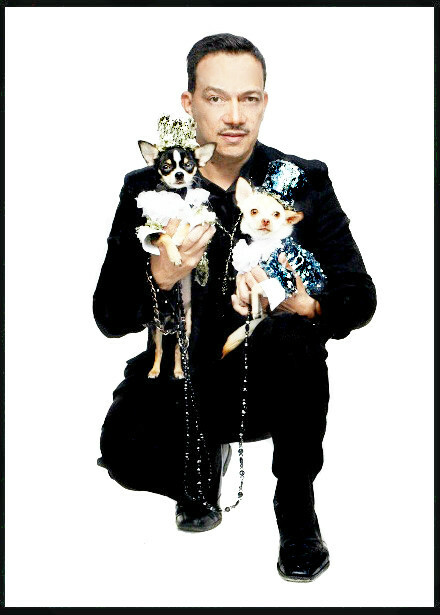 With a formal education in women’s wear design and twenty years of experience creating and innovating new concepts and techniques, Anthony Rubio had no reservations about delving into the world of pet fashions earning for himself the title of Master Pet Couturier. The pet industry is estimated to be a Fifty billion dollar industry worldwide and offered an opportunity for Mr. Rubio, who is recognized worldwide, to reach into his world of inspirations to create confections that every dog owner in the know wants to possess. His creations are strictly Couture and are considered collectible art inspired by anything from movies to fairy tales and especially by the best women’s wear couturiers of Europe. His masterpieces are born from an almost maniacal obsession to achieve perfection stemming from hours of sketching to innovating shapes and forms which are then meticulously executed and finished only when Mr. Rubio is completely satisfied with the final product. Mr Rubio is on the boards of several fundraising organizations and most recently was honored and awarded quite unexpectedly by The Humane Society for his humanitarian efforts in championing animal adoption. Anthony participates where welcomed to facilitate raising funds and awareness to the plight of animals that have no voices to express their needs or pains to make the world a deserving place for their unconditional love. Mr. Rubio is very dedicated along with his personal muses, twin one year old Chihuahuas Bogie the brunette named after Humphrey Bogart and Kimba the blonde named after a famous anime hero, to help abandoned, lost and abused pets when and how ever they can. As an advocate for pet adoption. Rubio created “Adopt Me Maybe?” adopt a shelter pet campaign. He started this campaign in an effort to promote shelter pet adoption verses buying a pet in a store. The “Adopt Me Maybe” pet adoption campaign went viral. Bogie and Kimba were the poster boys for the campaign. 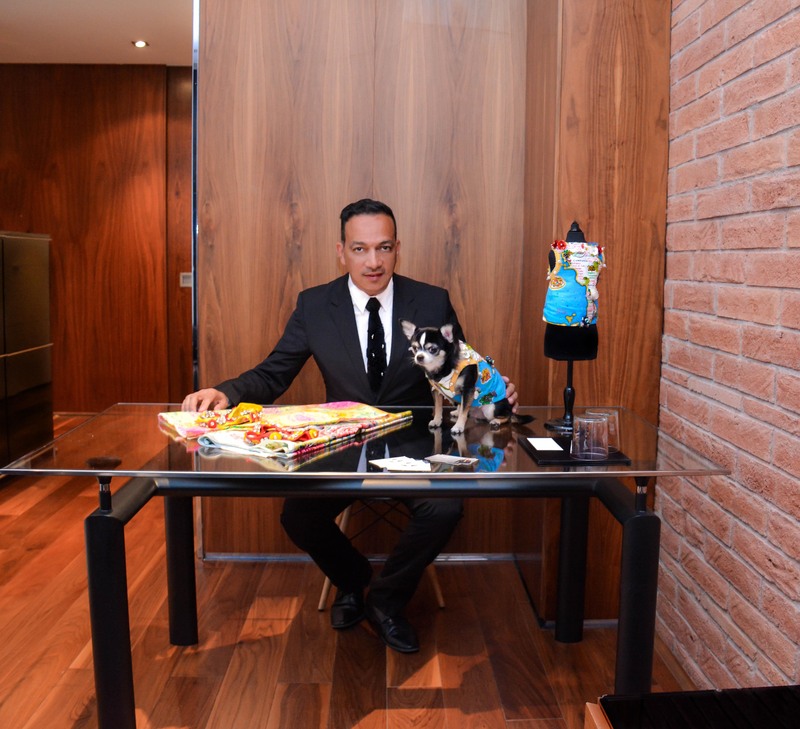 Anthony Rubio became the first pet fashion designer to showcase at New York’s Fashion Week in February of 2012. Mr. Rubio has been commissioned by Pepsi Cola Company, Macy’s, Saks Fifth Avenue, General Motors, EMI Records among many others. Please click on the “Press” tab for an in-depth look at Anthony Rubio’s career. Internationally acclaimed Pet Couturier, Anthony Rubio’s one of a kind creations have been featured on Good Morning America, TMZ, Perez Hilton, The Today Show, CBS morning show Live From The Couch, Fox’s New Day New York, news broadcast on CBS (3 times), Fox, NBC (twice), CNN (twice), ABC, USA Today, Sports Illustrated (twice), Anderson Cooper’s talk show Anderson, Cable Vision’s Pet Talk, Animal Planet, LX New York on NBC, NY 1 News, WPIX’s Morning Show, Multiple segments of Pet Fashion on Canada’s Pet Network, Multiple stories on Chance TV, VH1’s Best Week Ever and his creation of Donald Trump with signature comb over on his muse Bandit went viral and landed in an International TV commercial for Comedy Central. In July 2012 eight of Anthony Rubio’s Couture creations were featured in and were part of the World Record breaking $250,000. dog wedding appearing in the New York Daily News, television’s “The Insider”, Entertainment Tonight, On The Record with Greta Van Susteren, Teddy Hilton, VH1’s Best Week Ever just to name a few of mass media coverage. Represented Macy’s in the 12th Annual Macy’s Petacular in 2009 and 14th Annual Macy’s Petacular in 2011. Magazine and Newspaper covered include a 3 page spread in The Daily Mail UK in 2011, also in New York Times, Newsweek, American Dog Magazine, Animal Fair magazine, Time Out New York, New York Daily News, NY Post and every other major paper in the U.S. and Canada. Cover stories in The Sunday Times, South Africa’s largest newspaper and in Southern Weekly, China’s largest newspaper with circulation at 1.6 million copies. Also seen in international papers in India, Japan, Ghana, Great Britain among many others making him an international sensation. Article in The Latino Show Magazine. Internet articles and mentions include People Magazine’s People Pets, New York Magazine’s The Cut, Refinery 29, Dogster, Pet360, Fashionista, The Fashion Beast, PetSide, DNAinfo, Gothamist, The Hydrant among many others. Listed in the Top 5 on Dogster’s list of people you should know in the Dog World article. After 3 years in a row of winning his round, Anthony’s replication of Michael Jackson’s award winning Thriller Music Video featuring Bandit in the star role won the Top Prize at the 20th Annual Halloween Dog contest at Tompkins Square triumphing over 480 dogs. Pet Custom designer for Broadway play “Dog Park” in 2012. Created the pet adoption campaign “Adopt Me Maybe” which went viral. Top 5 Trending on Twitter. Tweeted by Katy Perry to 22 million followers. Individual stories by USA Today, Huffington Post , Yahoo News, Dogster, NBC’s Today.com, Cover story on BuzzFeed. Entertainment Weekly named it one of the Top 10 Best “Call Me Maybe” parodies. Lead designer in the hit book “Couture Dogs of New York” with the majority designs throughout the book including and front and back covers.